Ireland may have to wait beyond 2018 to make their Test debut, chief executive Warren Deutrom has warned. Both Ireland and Afghanistan were awarded full membership to the International Cricket Council (ICC) last week as they met for their annual conference in London. The two newest nations were voted in unanimously to become the first newcomers since Bangladesh in 2000 and take the number of full ICC members to 12. Ireland have been playing as affiliate members since 1993 and have recorded famous victories over Pakistan, England and the West Indies in that time. Now they will be able to play Test cricket against the world’s best - but scheduling a first match may take some organising and Deutrom believes it may prove difficult to shoehorn in around the other nation’s full schedules. Asked if Ireland would play their first Test in 2018, Deutrom replied: “To be honest there are so many pieces of this jigsaw. “It is probably somewhere between not wanting to wait years for our first Test match versus making sure we have the appropriate sense of occasion. “Another consideration is that we are ready to play our first Test match as we haven’t played a five-day game yet. “History would suggest that new full members play their first Test, at home, against a big nation within a year. “But I know how much busier the full members are with their own schedules so trying to find a gap within 12 months in an already-congested schedule is incredibly difficult. “We are going to do our best, we will have as many conversations as possible, but I can’t put any members on the spot, although quite a few have been generous to say ‘let’s have a conversation’. 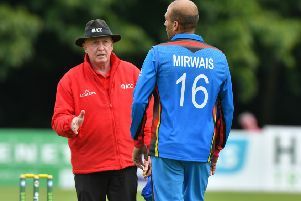 With most Test-playing nations having fixtures planned, it could be that Ireland make their bow against fellow newcomers Afghanistan, with neither Deutrom nor his Afghan Cricket Board counterpart Shafiq Stanikzai ruling out that possibility last week. The pair will also be pressing to learn when the financial benefits of being a full member of the ICC comes into play. For Deutrom it could again prove to be something of a waiting game. “My understanding is that, like any other business, the ICC will have budgeted for cash-flows in this year so to throw a couple of extra million in the pot may or may not be possible,” he added. “I suspect it will be the beginning of next year when the financial distributions for being a full member will commence. “My heart says it would be great to have the cash now, my head says it may well be better that we have six months sitting down and planning our priorities.